The first question is easy: Where in the world has XTC, perhaps the thinking person's smartest pop act, been for the past seven years? Andy Partridge, the group's chief songwriter and occasional dark cloud, expects this one. It's why he says he's sick of doing interviews. "I've done what is seemingly hundreds of them already, and I'm really beginning to dread them," he points out as this one starts. Still, his band's return, the acoustic and orchestral lushness of "Apple Venus Volume 1," recently arrived in stores. Long-suffering and undoubtedly frustrated XTC fans have surely been waiting with bated breath to hear it, and they're not likely to be disappointed. 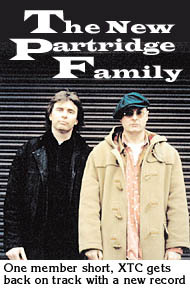 Though the group is now a duo of Partridge and bassist-songwriter Colin Moulding (guitarist Dave Gregory split acrimoniously more than a year ago), its core vision is intact and shining throughout "Apple Venus," much of it reminiscent of moodier, melancholy XTC efforts such as 1983's "Mummer" and the band's last work, 1992's "Nonsuch." That's more than enough to get fans salivating again for the cult act, and because of it, Partridge is likely going to have to deal with nagging interviewers for some time. See, as any self-respecting XTC fan knows, the band doesn't tour. It hasn't since 1982, when Partridge was supposedly struck with severe stage fright at the start of what should have been XTC's most successful tour to date. Given the appeal of the cheery "Senses Working Overtime" (the tune that counts to five in its chorus), it might have been the British band's breakthrough to American and worldwide success. Instead, Partridge withdrew to his home in Swindon, the band splintered and went in decidedly more mannerist, Beatlesque and Kinksian directions, garnering huge critical acclaim with its 1986 song-cycle "Skylarking" but finding only a small dose of mass popularity with one of that album's B-sides, the atheistic "Dear God." Still, Partridge says XTC is in tiptop shape, excited about the future and ready to make a little pocket change. But, um, where has it been? "Well, you know about the strike, don't you?" Partridge slowly, somewhat reluctantly began. Well, not everyone does -- at least, not in the States. And so Partridge runs down the story for what must be the 10th time in a week. "When 'Nonsuch' came out," he began, "we felt that it would be completely ignored by Virgin [then the band's label in England; it was on Geffen here]. And it was. It wasn't promoted at all. We went to them ahead of the release and said, 'Look, we're never going to make any money on this label. We're still in debt.' So we asked to be let go so that we could make a living at this for a change. Either that or make this better, so that we could stay on the label." But Virgin wouldn't do either. At the time, XTC still owed it four albums. "So we said, 'Fine, we're going on strike. We're not going to make you any more records.' They didn't think we were serious. They would book studio time and we wouldn't show up, and they still didn't get it. They sat on us. They wouldn't let us go for four or five years." During that time, much like Bruce Springsteen's idle time in the mid-'70s because of legal hassles, XTC was unable to record as XTC. "We wouldn't dare go near a studio for fear that anything we put down would be seized upon and released," Partridge said. Of course, while the band was spending this time "in the fridge," as Partridge calls it, songs were being written. A lot of songs. Dozens of songs. Hundreds. "When we were finally released from our contract [at the end of 1996] and went back into the studio, we realized we had a large stockpile of songs," Partridge recalled. The band didn't know where to start. Consequently, they went back to where they left off, with Partridge guiding the way toward a more orchestrated, delicate, but undeniably dark album -- something that would very much be an extension of what "Nonsuch" had set in motion. In fact, given that all of the tunes for "Apple Venus" were written in 1992-94, it's precisely the album XTC might have released in, say, 1995. As it is, XTC is now launching an all-out, yearlong blitz. Or at least, a blitz in XTC terms. In the past few months, the band signed with American indie label TVT, best known for giving the world Nine Inch Nails; published "XTC: Songs & Stories -- The Exclusive Authorized Story Behind the Music" (Hyperion), an album-by-album dissection courtesy of Partridge and Moulding, with author Neville Farmer; released "Transistor Blast," a four-disc collection of rare BBC sessions, many from its non-touring phase, as well as complete concerts from its nervier days in the late Seventies; and it has plans for a harder-edged, more rock-oriented "Apple Venus Volume 2" to be in stores by fall. "It's not recorded yet," Partridge admitted, "but I really would like to put out two XTC albums in one year. It would be the first time since 1978." That's a remarkable slate for an exceedingly enigmatic band. But even if the periphery product falls by the wayside, "Apple Venus" is likely to be remembered. It's gorgeous in spots, almost painful to hear as it concludes, and loaded with patented XTC style. As Partridge notes, bemused, "I only really have a few themes that I keep revisiting -- the car, not having enough money, the cyclical nature of the seasons and the world and growth and death." "Well, a big one I seem to have gotten out of my system is nuclear war. I had been on that one for a long time," he said, bringing to mind the eloquent doomsaying of "This World Over" (from 1984's "The Big Express") or "Scarecrow People" (from 1989's "Oranges and Lemons"). But he added, dryly, "all those ban-the-bomb people, you know, they thought it was the right thing at the time, but actually, it turns out nuclear power is just great." He's sarcastic to a fault, and sometimes it seems like a defense mechanism. It's also at the root of most of the new album, especially its most overtly biting moments, such as the liquid anger of "Your Dictionary" ("H-A-T-E // Is that how you spell ‘love’ in your dictionary?"). That song is what Partridge figures is the "biggest slab of anger" found in his music since his nasty divorce in 1993. "I tried not to let it sink into the music too much, but I guess it's inevitable that it seeps in drips and drabs." After being "unceremoniously cuckolded" by his first wife, Partridge fell in love with a New Yorker he knew for many years but says the experience still has its scars. The album's exquisite peak, in fact, is riddled with broken hearts. "I Can't Own Her" begins the conclusion. "One person was departing from my life, tearing me up, and the other was coming, and I couldn't own either one," Partridge explained. "And that's how it is in love: You want to possess someone so much, if only to stop them from leaving, when in fact that suffocation is what may make them leave." That's followed by the sumptuous, teary-eyed rumination "Harvest Festival," something of a "Skylarking" in miniature in which the antagonist autumnally remembers the good times, his own joy over love and marriage, then the hurt and the final closure over his failed marriage. It's mighty powerful stuff, and Partridge admits it turns a corner for him. "I tend to hide behind masks, where I can call myself ‘she’ or ‘he’ or ‘they.’ They all have a bit of me in them, but I can generalize. A lot of this one was me lifting up the stone and finding a little grub exposed in the sunlight - and all I wanted was to be safe with a big wet rock over me." Which is probably what he'll do now. "Volume 2," when it arrives, will consist of the material Partridge and Moulding wrote in 1994-96, though seen through 1999 eyes. Either way, the XTC sound -- however that might be defined -- has been set in place permanently. With Gregory's departure, shy Moulding's continued support, a new label in his corner, and his income at last in the black, there's finally nothing standing in Partridge's way to create what he wants when he wants to. It will continue as XTC, naturally. "Brand awareness is important," he said, in the same way that Chrissie Hynde has never recorded as anything other than the Pretenders. But, Partridge was quick to note, "After 20-odd years, there's no two ways about us anymore. People either like us or they don't, in the same way that you either like chili or you don't like chili. This one [the new album] especially may not be everyone's cup of tea, but I think that's fine. I mean, what's any different about that now than before?"